A common cause of hand pain, numbness & weakness. 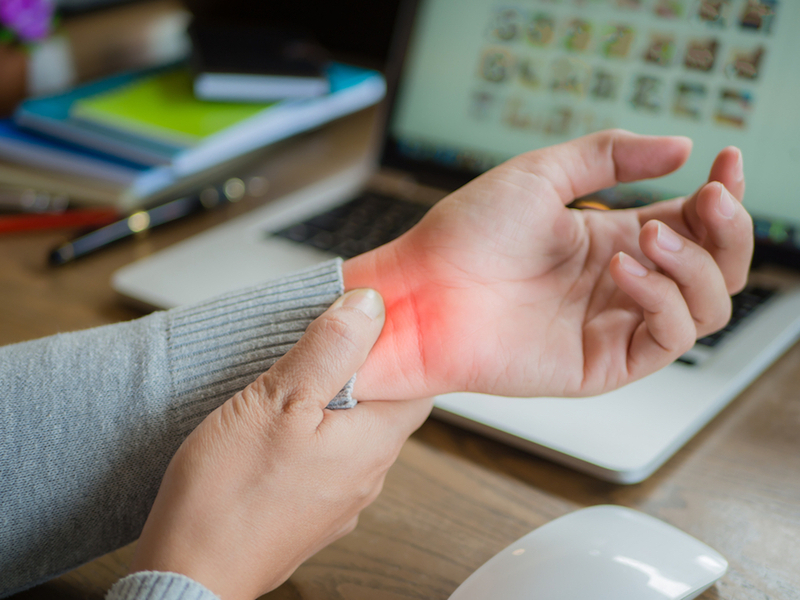 Carpal tunnel syndrome is caused by a ligament in the wrist pressing on the nerve, which supplies sensation and strength to parts of the hand. This is called the median nerve. In most cases, a specific cause is not known. However overuse (such as typing on a computer), thyroid disease, rheumatoid arthritis, diabetes and pregnancy are common factors that can cause the ligament to thicken, press on the nerve and cause symptoms. Most cases of carpal tunnel syndrome present with pain. 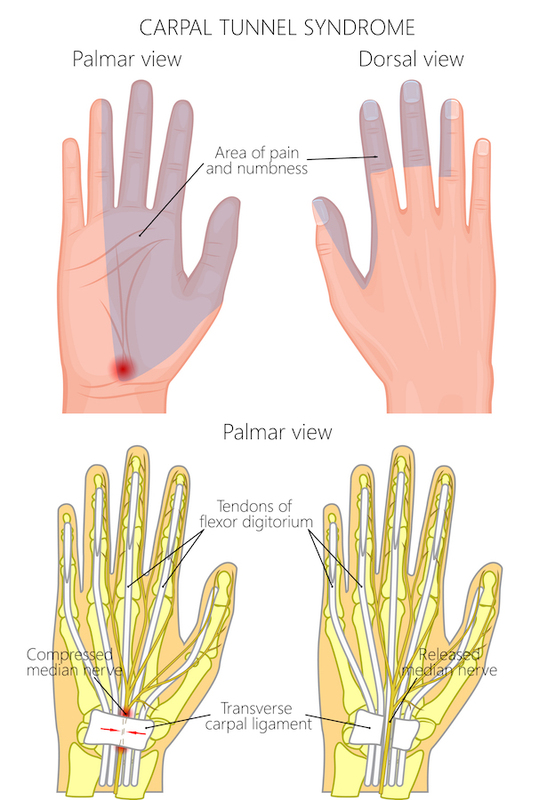 Numbness may be occur in the palm of the hand. In severe cases, the muscles of the hand can become weak and atrophy (shrink). The pain is commonly present at night and patients need to wake up and “shake out” their hands. This is because most of us sleep with our hands and wrists curled into our chests. Often, treatment of the underlying disease can improve symptoms. Treating a thyroid or diabetes condition can improve the symptoms. After birth of the baby, pregnancy induced symptoms can resolve. Sometimes a patient can wear a brace, which prevents bending of the wrist. Steroids and other injections into the wrist may help some symptoms. In the 1950’s, surgery to relieve carpal tunnel syndrome was described. By cutting the ligament that presses on the nerve (transverse carpal ligament), pressure on the median nerve can be relieved. This typically is a few centimeter incision on the palm of the hand. A disadvantage to this technique is scar formation and this can lead to reoperation. Since the late 1980’s, endoscopic carpal tunnel release was developed. This provides a smaller scar. However a potential disadvantage to this technique is that the limited incision may lead to incomplete cutting of the ligament and greater risk of nerve injury. This again could lead to reoperation for persistent symptoms. In either case, carpal tunnel release surgery is usually an outpatient procedure with good results. Carpal tunnel release surgery is usually an outpatient procedure with good results. It has greatly been debated which technique, open or endoscopic, is better for carpal tunnel release. In summary, there may be a higher risk of incomplete decompression and nerve damage in the endoscopic technique. There appears to be no difference in long-term pain or strength/ sensory improvement between open and endoscopic technique. Endoscopic patients may have quicker pain relief. There appears to be no difference in how quickly patients return to work between techniques, although the endoscopic incision probably heals quicker. The cost of surgery may be higher with the endoscopic technique. If you would like to know more about carpal tunnel release surgery, please contact us at Rocky Mountain Brain & Spine Institute.